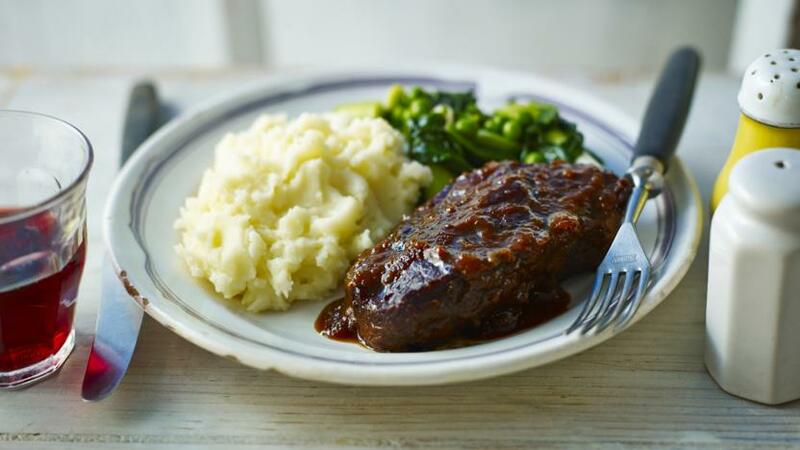 Prepare yourself for a posh, braised steak. It tastes so good that guests will think you’ve been slaving away for hours. Return the frying pan to the hob and reduce the heat. Add the remaining oil and gently fry the shallots, celery and carrots for 6-8 minutes or until golden-brown and softened. Stir in the garlic, cook for a further minute and add the mixture to the casserole. Deglaze the pan with wine and allow to bubble for a few seconds, stirring constantly and pour over the meat and vegetables. Stir the stock and the tomato purée. Strip the thyme leaves from the stalks and scatter into the pan, add the bay leaf and mustard and stir until well combined. Bring to the boil and remove the dish from the heat. Cover the surface of meat and liquid carefully with a piece of greaseproof paper. Place a lid on top and cook in the oven for 3-3½ hours or until the beef is very tender. Skim any fat away from the surface that appears during cooking. Transfer the meat to a plate. Strain the cooking liquor and vegetables through a sieve into a large non-stick frying pan. Press the vegetables with the bottom of a ladle to extract a rich purée and stir into the cooking liquor. Add salt and freshly ground black pepper, to taste. Bring the mixture to a simmer for 3-5 minutes, or until the sauce is well reduced, thick and glossy. Add the beef to the liquid and heat through for 3-4 minutes, spooning over the sauce to glaze. Serve with some green vegetables and mashed potatoes.